Kennards Hire has introduced the revolutionary cut-n-break plunge saw, which can cut to a depth of 400mm (16in). 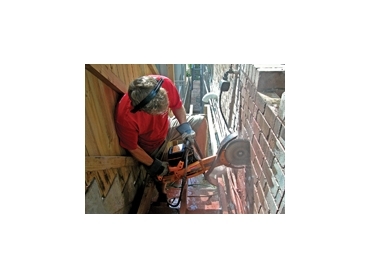 The plunge saw enables door and window openings can be in double brick or concrete tilt walls from one side, instead of having to work from opposite directions. Kennards, cut-n-break saw employs a totally different approach. Twin blades cut to a depth of 65mm (2 1/2in), forming a core in the saw cut. The core is broken away using a special supplied tool and the process repeated until the required cut is achieved. The cut-n-break saw is a power tool and is also good for crack renovation, expansion joint repair and creating channels for up to 20mm (3/4in) diameter water lines and electrical conduit in a single pass. According to an operator in AB’s plumbing and gas, who hired the saw from Kennards meant that the job was done in half the time than it would normally have taken. Powered by an air-cooled, 4.8hp, two-stroke engine, it weighs 10.3kg (22.7lbs) with blades attached. The cutting blades have a diameter of 230mm (9in).